A short year ago, I wrote an honest, reflective post on releasing expectations of how things should be and enjoying the way they actually are. I mentioned the importance of my goals, hopes, and dreams in moving me forward, but that I had learned to release the need for plans, for needing things to be a certain way in order to be happy. Interestingly, just over a year later, I am actually living one of those dreams. 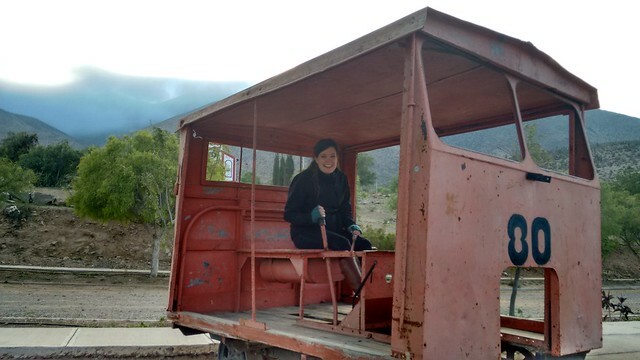 I am living in the Valle de Elqui, Chile, and working for a respected nonprofit, the same one I dreamed of working for when I was finishing my volunteer year in Peru. I am in charge a group of volunteers and using everything I learned from my year in Peru to help them adjust to their new reality and deal with the inevitable challenges that arise from starting a new, if temporary, life in another country. Five months into my life here and four months after the volunteers arrived, we are finally finding stability in our volunteer roles and living situations. It has taken longer than we all expected, but life is like that sometimes. And that is the thing about expectations: there is no point in having them if you are not willing to adjust them. I am still learning how to do so in my life in the Valle de Elqui. Part of this has to do with the fact that I constantly float back into American culture, with its demands and inherent beliefs, while interacting with my colleagues in the US and my volunteers here in the field. Another part is because I still have room to grow. I am learning to accept that I cannot control what happens, and that is where life gets interesting. Last month, I had the chance to talk with my parents about how different my reality is from what I thought it would be, and I laughed constantly at the completely different experience I am having from what I thought I was getting into. Being able to laugh makes things a lot easier here; you realize that your problems actually come from being frustrated that things are not the way you want them to be, even though the way they actually are is completely fine. Thankfully, I work for an organization that values reflection, something I personally love to do and which has helped me squeeze even more out of the experiences I’ve had in South America. As I have been planning sessions for our mid-service conference, which is now just two weeks away, I have decided to include activities and discussions based on comparing our expectations coming to Chile and our current reality, and revisiting the goals that we set at the beginning of our time here. Personally, staying focused on my own goals has helped me weather the (sometimes literal) storms, and will be the subject of a future post. As always, I feel that it important to do what you ask others to do, and by doing so, I have realized (yet again!) how much I personally need to relax my own expectations and embrace what is actually happening at the moment. Here is a list of what I thought life was going to be like in Chile, contrasted with my current reality. In most cases, my life here is better because I didn’t get what I thought I wanted. Expectation: I would live independently and be in charge of my own meals. Reality: I live with a host family and my dinners are provided for me. Brightside: My host mom and I get along really well, and she is my biggest support and ally here. She understands my vegetarianism and is a good cook. She makes an effort to provide lots of delicious salads and healthy, fulfilling meals. Having my biggest meal of the day provided for me helps me save money and time. Beyond the food, it is nice to have company. Her kids are also adorable and entertaining, and by watching her take care of them, I have learned about the ups and downs of being a parent. Her extended family is also part of my social circle now. Without them, life would be a lot more boring here! Downside: Family drama is universal! Expectation: I would not have to live with any of the volunteers. In fact, I verified this before accepting the position, so reluctant was I to sign up for another year of cohabiting with coworkers! Reality: I live with one of the volunteers. Technically, I live in a separate apartment, and he lives with the family “next door.” But for all extents and purposes, I am still living with a volunteer, even if I don’t have to share a bedroom this time around. Brightside: I always have company and someone to talk to, and it makes our dynamic with our host family that much more interesting. Since there are already two of us in the same location, we often have a reason to have the other volunteers over. Downside: It is really hard to maintain professional boundaries when you live with someone you are technically in charge of. After a year living in a volunteer house, I was already well aware of this reality and am not really any better at it this time around. That’s just life! Expectation: I would live and work in Paihuano. Reality: I live and work in Vicuña. Brightside: I actually much prefer Vicuña to Paihuano, so this has been a blessing. Vicuña has two supermarkets and is that much closer to La Serena, the closest city. There is less tourist exhaustion here, so people are generally very curious about me and my work. Since I take public transportation all the time, people are starting to recognize me, which is quite amusing. Downside: The project we work with is just getting started in Vicuña, and there have been a number of setbacks related to finances and supplies, which are finally getting sorted out, even though that we are just three weeks from winter vacation. Because of the newness of the project, the schools and teachers I work with still are learning how to best work with volunteers. Expectation: We volunteers would be helping to meet a serious need for English teachers in the Valle. Reality: We actually work with co-teachers. The majority of the teachers we work with speak excellent, fluent English and they are all talented, experienced, dedicated teachers. We provide the “native speaker” motivation factor and an opportunity for cultural exchange. I wouldn’t say teaching English is our primary role here. Brightside: I have been able to pick up some good techniques on working with kids, especially very young learners. One of my co-teachers is super receptive to my participation in class and I really enjoy sharing my teaching style with her and the students. Downside: I miss being in charge of my own classes. Expectation: The small towns in the Valle would be like the quaint villages I passed through in the Peruvian and Ecuadorian Andes, like Vilcashuamán. Reality: Despite being a rural area, the general feeling of the Valle is fairly suburban. You do see a lot of horses and fields, but for the most part, the communities of the Valle remind me of the small town life I fled from when I left New Hampshire 15 years ago! Brightside: Because the towns are small, they are very safe. It is refreshing to not constantly be on guard here. Downside: There is a common saying in Chile: Pueblo chico, infierno grande (Small town, big hell). I am not a big fan of the gossip and small town dramas. I definitely miss city life. Expectation: I would have a convenient, nearby escape to the coastal city of La Serena, just like I escaped from Huaycán to Lima. Reality: It is actually really expensive and time consuming to go to La Serena. Buses come every 20 or 30 minutes, and there are no buses at night. Hostels in La Serena are expensive. On top of that, I don’t even really like La Serena, try as I might to find its charm! Brightside: I am not spending as much money going out, and am investing my time and energy into other projects on my weekends. I really appreciate my time in Santiago when I have to go there, and I especially enjoyed revisiting Buenos Aires a few weeks ago. I appreciate cities a lot more now. Downside: Sometimes you just need a break from the quiet routine of the Valle, and La Serena just doesn’t meet that need. Expectation: I would keep up with this blog and finish writing about my 2013 trip. Reality: Due to my very limited internet, it takes a lot more planning than I expected to write blog posts, and especially to upload photos. I can only upload photos when I am not physically in the Valle, so this means on my trips to La Serena or Santiago! Brightside: This month, I have given myself a writing challenge (more on that in a future post! ), and this has helped me to jumpstart my desire to blog once again. After the winter vacation in July, I am going to plan monthly retreats to La Serena to write blog posts. I also use Instagram a lot more to make sure I am documenting my Chilean journey. I have also started drafting posts on my computer, but because my blog is so photo-focused, it is more challenging. Downside: This blog is not getting the attention I want to give it. I started this particular blog post three weeks ago on my phone, and I am going to publish it without my normal amount of photos because it takes too long to choose photos from Flickr when in the Valle. Expectation: I would have consistent internet and be able to use Skype to keep in touch with family and friends, as well as to continue tutoring students through English with Kim. Reality: My internet is incredibly limited and unreliable. I cannot use Skype where I live. If I am lucky, I talk to my friends or family over Google Hangouts or Skype once a month when I am in Santiago or La Serena. English with Kim is on hold and I had to give up my students for now. Brightside: I use the internet less and have adjusted to not having constant access. I still have consistent access through my phone’s data plan and tend to chat or send emails more. I plan in advance what I plan to do during my internet time and do more in my off hours. I know I will use my time at the computer more productively when I once again have consistent internet. I am more motivated than ever to pick up where I left off with English with Kim, and am brainstorming other ways to keep it going over the next six months. Downside: I really miss working on my business and this blog. When I was really dealing with culture shock in April and May, I needed to talk to my friends and family more than I was able to. I can’t do as much with social media for my job as I would like. Expectation: The Valle would be really beautiful. As you can see, I have been able to embrace my current reality, and what hasn’t worked out has helped to highlight what is truly important in my life. As I mentioned above, our mid-service conference will be in two weeks. My winter vacation starts in three weeks, and a dear friend from Boston is coming to visit! After the break, the last six months of my position will fly by, and I will be moving on to other adventures, still completely undefined at this point! If I’ve learned anything, I’m better off going into the rest of the year without any expectations!